"There are numerous environmental challenges, some long standing and some new, that are having a significant impact on society, the economy and the environment"
Based on ideas of natural prosperity and a greater understanding of how the natural world supports well-being in societies, Professor McGlade examines how we can create regenerative economies that go beyond 'living within the planet's limits'. Areas covered include climate change and poverty, sustainable food systems and food security, building a circular economy and creating 'business unusual' strategies to build innovative sustainable business development, in a time of rapid technological change. Professor McGlade said: "There are numerous environmental challenges, some long standing and some new, that are having a significant impact on society, the economy and the environment, and which are leading to poverty, food and energy insecurity, loss of biodiversity, pollution, land mismanagement and desertification, among others. "Fortunately, there are signs of a growing momentum to tackle these challenges by embracing innovative approaches. For example, there are many instances of communities directly addressing water scarcity, food insecurity and clean energy through strengthened community action, rethinking economics and deploying innovative, green financing to gain access to new, agile technologies." Professor Jacqueline McGlade is a British-born Canadian marine biologist and environmental informatics professor whose work on open access information, citizen science and big data has transformed the way many of the institutions to which she is affiliated access and share information. As former Chief Scientist at the United Nations Environment Programme (UNEP), where she was also the Director of the Division for Early Warning and Assessment, her work focused on keeping the state of the environment under review through live open data monitoring with focus on air pollution, climate change, health and the development of the UN Sustainable Development Goals' environmental indicators. 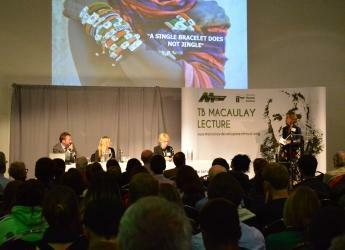 Presented by the Macaulay Development Trust and the James Hutton Institute, the annual T.B. Macaulay Lecture is held to honour the vision of Dr Thomas Bassett Macaulay, President and chairman of the Sun Life Assurance Company of Canada, whose benefaction founded the original Macaulay Institute for Soil Research in 1930. He was a descendant of the Macaulays from the Island of Lewis and his aim was to improve the productivity of Scottish agriculture. This vision continues today in the work of the James Hutton Institute.